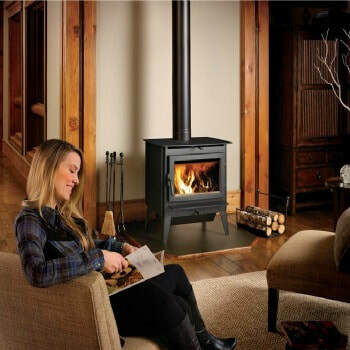 The Lopi Evergreen | Free Standing Wood Burning Stove sets the bar for performance, function and design. The Evergreen will beautifully accent your home’s design. This unit is crafted of heavy gauge steel and includes a durable door, with a self-cleaning glass viewing space! This model is very efficient. With a secondary combustion design, environmental pollution is reduced and the stoves efficiency is boosted. This technology delivers cleaner fires that use a smaller amount of wood and saves you money. You will be able to eliminate smoky startups with the unit’s bypass damper that lets you control the smoke within the stove. Manage the unit’s burn rate effortlessly with the single air control. Choose between your choices of pedestal or leg option model. A large ash pan is included that allows for quick removal of the ash. Consider adding the optional 400 CFM fan, which helps distribute radiant heat throughout your house. Weight: 435 (legs), 450 (pedestal) Lbs. Maximum Log Size: 20-1/2 "